What is Model N CPQ? Model N CPQ is an enterprise-grade, Salesforce-integrated cloud-based CPQ software. It helps companies in streamlining their quoting workflow and enables sales representatives to offer estimates expediently from any device. Model N CPQ also guides sales representatives throughout the quoting process to ensure that they choose the right mix of products and services from the catalog to offer that meet their clients’ needs. Plus, Model N CPQ expedites the delivery of quotes and nods of approval to decrease the instances of workflow bottlenecks. This way, estimates get to clients faster and approvals achieved sooner. Moreover, Model N CPQ is equipped with out-of-the-box integrations that close the gap between processes and solutions. With Model N CPQ, sales representatives are guided through the quoting process. This ensures that they select the right products and services to offer to their customers. This way, they can maximize their revenue while meeting their clients’ needs and aligning their quotes with the company’s goals. Through Model N CPQ, companies and their partners can instantly generate accurate estimates. The application gives them access to advanced pricing tools that make certain they offer the right product at the most optimum price at the perfect moment for increased chances of closing a deal. Companies can employ Model N CPQ to make their quoting and approval processes straightforward. This decreases customers’ waiting time for estimates and reduces the instances of workflow bottlenecks. The application does this with various tools such as guided selling, automated approvals, Microsoft Word redlining, and quoting in Microsoft Excel. Model N CPQ serves as the bridge between Salesforce and SAP. By closing the gap between the two solutions, enterprises give their sales teams updated product and pricing information. Additionally, these integrations promote a smooth quote-to-cash process as quotes generated in Salesforce can be transferred to SAP as functional work orders. 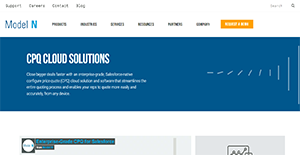 If you are considering Model N CPQ it may also be beneficial to analyze other subcategories of Best CPQ Software listed in our database of SaaS software reviews. It is important to realize that almost no software in the CPQ Software category will be an ideal solution able to meet all the goals of different business types, sizes and industries. It may be a good idea to read a few Model N CPQ reviews first as some software can dominate only in a very narrow group of applications or be created with a very specific type of industry in mind. Others may work with an idea of being easy and intuitive and as a result lack complex functionalities desired by more experienced users. You can also come across solutions that cater to a large group of customers and give you a complex feature base, but that in most cases comes at a more significant price of such a service. Ensure you're aware of your requirements so that you select a solution that provides all the features you look for. How Much Does Model N CPQ Cost? Model N CPQ is an adaptable solution that aids sales representatives in the quoting process. Enterprises interested in employing the software can ask for a demo and request for their enterprise pricing information from sales by phone or web form. We realize that when you make a decision to buy CPQ Software it’s important not only to see how experts evaluate it in their reviews, but also to find out if the real people and companies that buy it are actually satisfied with the product. That’s why we’ve created our behavior-based Customer Satisfaction Algorithm™ that gathers customer reviews, comments and Model N CPQ reviews across a wide range of social media sites. The data is then presented in an easy to digest form showing how many people had positive and negative experience with Model N CPQ. With that information at hand you should be equipped to make an informed buying decision that you won’t regret. What are Model N CPQ pricing details? What integrations are available for Model N CPQ? Model N CPQ synchronizes with SAP and Salesforce. If you need more information about Model N CPQ or you simply have a question let us know what you need and we’ll forward your request directly to the vendor.